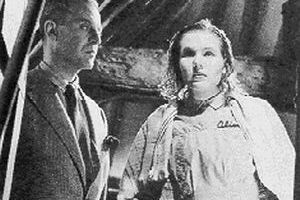 A Canterbury Tale became Powell and Pressburger's first critical and box office failure. 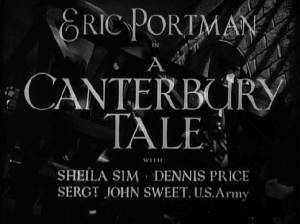 Perhaps Powell's most personal and misunderstood film, set in and around his beloved Canterbury where Pressburger, as a Hungarian with a stateless passport, was denied permission to work. At the heart of the film lies a deep love of England, its heritage and its future. The mystical quality and poetic vision of the film is only now being fully recognised, but in 1944 there were few willing to accept a fanatical poet figure expounding his philosophy on life. 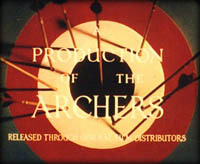 Casting included Esmond Knight in three roles: first as Narrator, speaking from Chaucer's Canterbury Tales, and later in two small comic roles - one a British soldier comparing notes with Bob Johnson, and the other in a hilarious scene as a Village Idiot. 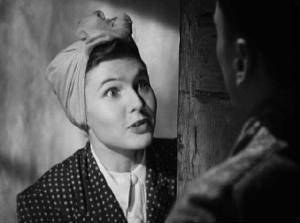 Of the leading players, apart from Eric Portman in a role refused by Roger Livesey who evidently considered the part distasteful, the remaining three performers were all making their screen debuts: Sheila Sim inherited the role of Alison the Land Girl intended for Deborah Kerr, now under contract to MGM. Dennis Price was to become a popular ingredient in many British productions of the next 30 years, while for the story's American soldier, Powell discovered non-professional actor John Sweet, a US Army Sergeant, appearing in a touring production of Our Town. 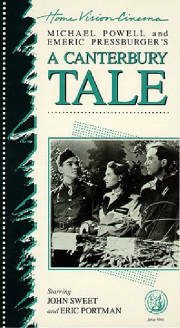 The surprise hit of the picture, John Sweet gained excellent reviews; this was to be his only screen appearance and he returned to teaching in America after the war. Three train passengers arrive during a black-out at Chillingbourne in Kent and, as they make their way through the village, Alison Smith has something poured on to her hair by an unseen attacker. At the town hall they learn that she is the eleventh victim of the mysterious 'glueman'. Magistrate Thomas Colpepper arranges for Bob Johnson - an American soldier who had intended to get out at Canterbury - to stay at a local guest house and hopes that he will stay to see more of the country, although Bob is anxious to move on. Alison, Bob and Peter Gibbs attend Colpepper's lecture next day on the history of the Pilgrims Way and the surrounding area. Moved by the talk, Alison later revisits the scene of a pre-war caravanning holiday spent with her fiancé, now missing in action. There she meets Colpepper, who finds that she too has a love of the countryside, though for different reasons. Unseen, they overhear Bob and Peter discussing their lives before the war and their suspicions of the 'glueman's' identity. On the train next morning, Colpepper admits that he is the glueman, but claims his intention was to drive girls to his lectures where they might learn the importance of their national heritage instead of going out with GI's while their sweethearts are away. Peter determines to report him on their arrival, but Colpepper insists that he will receive his own judgement. At Canterbury Bob hears that his girl has enlisted in the WACs and receives several letters telling him all is well. Alison visits the blacksmith where her caravan is stored and learns that her fiancé has been found alive in Gibraltar, while Peter - a classical music student who was forced to take work in peace time as a cinema organist - realises his ambition to play the organ inside Canterbury Cathedral during a service for the departing troops. All have received their blessings save Colpepper, who must serve his penance alone.